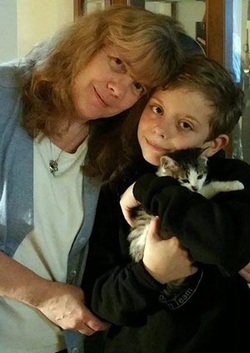 Diane started out with a free kitten offered on craigslist, but when offered help ended up as one of HCMT and Pittsburgh C.A.T.’s most constant foster homes, and she has a secret weapon—her eight-year-old son Connor, the cat whisperer, who can socialize any cat he meets. In spring 2014 Diane’s daughter found a kitten and Diane advertised it free on craigslist but required a vet reference from the adopter. Several members of HCMT and Pittsburgh C.A.T. regularly browse craigslist looking for cats and kittens offered free just as much to investigate the situation and make sure the cats and kittens are safe as to offer assistance with low-cost spay and neuter. Tarra Provident contacted Diane with help and added her to Pittsburgh Feral Cat Movement. “I saw how many kittens and cats needed help so I set up my basement to foster,” Diane said. “Michelle sent me my first litter and less than a week later my second litter.” Just that quick she was in the thick of things. She and Connor (her cat whisperer) socialized over 40 cats for adoption in 2014 and in 2015 are at 15 or more that have been placed, five currently fostered in her house and four more that came from the clinic this past Sunday. “Connor of course is as big of part of the volunteering as I am. He loves to wear his Pittsburgh CAT shirt and will tell anyone what he does,” she said. She’s been learning how to treat cats with various illnesses because almost all fosters have something wrong with them. Diane feels she is best at working with kittens under four months old because of still being new at fostering, but Connor has proven he can socialize any age. Because she has fostered so many cats she finds people are starting to know what she does and are asking her for help with cats more often. Because trapping cats is often done at night, in all sorts of weather, or just as often in sketchy neighborhoods, she can’t help with trapping because she could not take Connor with her. But in addition to fostering she volunteers in recovery at clinics and takes home a few souvenirs—more foster kittens. “I don’t think there has been a clinic yet that I have not brought home fosters from,” she said. And working with cat rescue has not only changed her life and Connor’s but her daughter is actually looking into going to vet tech school after being a part of helping with sick cats. Her oldest son is her pet sitter when they have to go away for any reason. This is all new to Diane. Her only experience with cats before volunteering for Pittsburgh C.A.T. or HCMT was having her own cats. Her first cat was a rescue off the streets when she was 17 and in her first apartment. Spices lived to 19 years old and was Queen of the house. Including Spices she has had eight cats in her life, and four are in her house now. And like many people who live with cats, she also has two dogs. She works for a pharmacy during the day, but works from home so she can have fosters around her all day long. In the past two months she has placed six kittens and is trying to place four more that are ready for adoption. One of the fosters has cerebellar hypoplasia but is so loving Diane hopes she finds a home soon as kennels are no place for adult cats. Any cat or kitten would be lucky to be fostered by this loving mother and son duo.